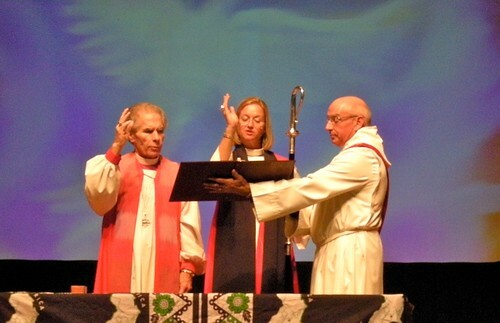 The Episcopal Diocese of El Camino Real held its Diocesan Convention 2009 last weekend. I was a Delegate from St. Andrew’s Episcopal Church (Saratoga, California) and my husband, John Plocher, was an Alternate Delegate and also backed up Web Sacristan Stephenie Cooper in managing the information flow to the big screen. Our son Paul was a convention Youth Representative for the first time. This blog entry is to document how Stephenie and John set things up so that there is a record for our own future use (and because it might be of use to others). This blog does not provide much information about the sound system, which had a separate crew managing it. Stephenie has been running the computers for convention for many years; this is John’s first time. The computer resources required to run convention have been doubling or tripling each year. The big screen presents everything at convention, including the agenda, instructions, song lyrics, the text of resolutions and ballot lists, plus videos and slide shows. 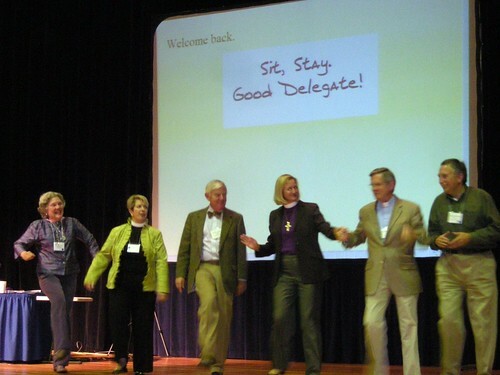 The convention has a somewhat flexible schedule since resolutions may be amended, discussions may go longer or shorter than planned, and people may arrive with a video or slide show to add that is unexpected or does not match what they said they would bring. The convention follows Robert’s Rules of Order for meeting procedure. Stephenie lives near us, so she and John mocked up the convention audio/visual layout at our house in the weeks before the event. They used almost every laptop we had plus monitors borrowed from the computer lab at SMUM (Santa Maria Urban Ministry). John bought about $125 in bits and pieces to put everything together. Stephenie and John relied on PC and Mac laptops using simple and standard tools. That is, the displays used the same hardware and software tools with which the information was originally put together. There was no special software package. Reusing standard pieces allowed quick responses plus maximum flexibility, additions, and changes during the event. 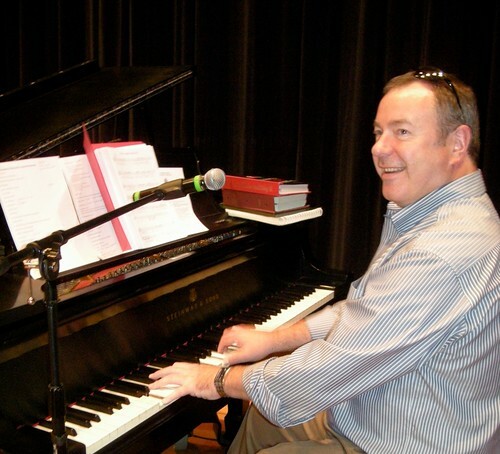 There was much dynamic interaction and modification of both music and meeting content. In general, Stephenie ran the screen while John queued material and coordinated with people who came backstage to add or change or discuss what was coming next. 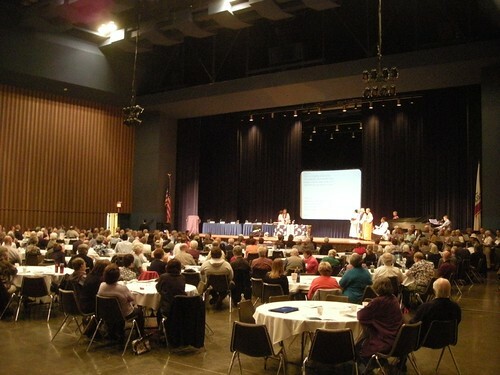 Project desired content on main auditorium screen where it can be seen by delegates and head table. Show slideshows, movies and presentations authored and produced by others. Show song lyrics – and follow along verse by verse as sung. Show announcements (break, lunch, count down timer). Modify to show motions to amend in progress. Show total and individual debate limit timers. Update as voting results dictate. Show “default background image” whenever other content is not being displayed. Allow real-time editing and addition of content – agenda changes/reordering, new songs, movies, resolutions, etc. Synchronize activities to meeting in progress as dictated by the Secretary of Convention. Do this all from a back stage position without direct views of auditorium or head table. 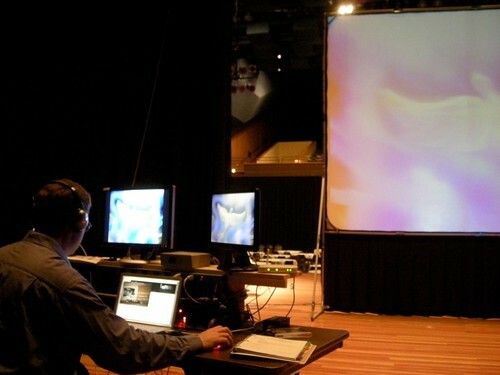 A 4-way Video Amplifier cabled to a local video monitor, the projector and a head table monitor. 4 laptops, which were connected to external video monitors and configured to use both the laptop screen and the external monitor as an “extended desktop”. 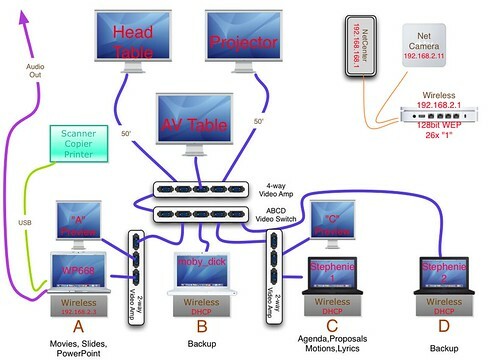 2-way VGA amps connected to each laptop so they could drive both the monitor and the KVM switch/video distribution amp setup. The use of a dual-monitor setup allowed us to edit and direct content from one screen while using the other as a potential video source (more on this below). All systems were set up to use the convention “image” as the default desktop screen background, so that when no windows were open, their “second” display could be used as a placeholder video source. One system was set up to be the presentation and movie display host. Quicktime, powerpoint and other software was loaded onto it, and its “headphone out” audio jack was connected to the house sound system. A monitor speaker was run from the house sound system so that John and Stephenie could hear what was happening in front of the screen and in the hall. There was also an audio feed into the sound system so that music and movies could play from the computers. A third system was configured as a web page editing station in addition to being the primary content display driver. The content was accessed by special links from an annotated detailed agenda that sported additional presentation cues, such as “SONG”, “RESOLUTION 1”, “LUNCH ANNOUNCEMENT”, “MISSION MOVIE”, etc. All content on this system was in HTML, and the special <href> links on the detailed agenda (and on the song lyrics index page) were of the form <A …. target=”projector”>…</a>. This allowed us to display the detailed agenda and song lyrics pages iin a browser window on the laptop screen, and have the “projector” window that popped up when a link was clicked positioned “fullscreen” on the second monitor. Displaying any piece of content was as easy as clicking on its cue. The last system displayed a copy of the detailed agenda. Its second display was cued with a copy of the 1-page simplified agenda used by the delegates. This proved to be useful in coordinating a presentation and lyrics from two systems or to pull up a default display during breaks. Bring and use at least 4 video monitoring cameras so that backstage can see the head table, the presenter’s lectern, the musicians and the delegates/audience. Being limited to only one of these shots made coordination and timing difficult. If there had been more debate on the resolutions, we would not have been able to closely coordinate timers, motions and the like. Move the main display screen up from the stage by at least 8 feet to get it out of the direct and reflected stage lighting (improves sight lines, heightens contrast). Choose a sans- style font and a better background/foreground color contrast for greater visibility in the large hall. Play to the eyesight of the most senior members of the group. 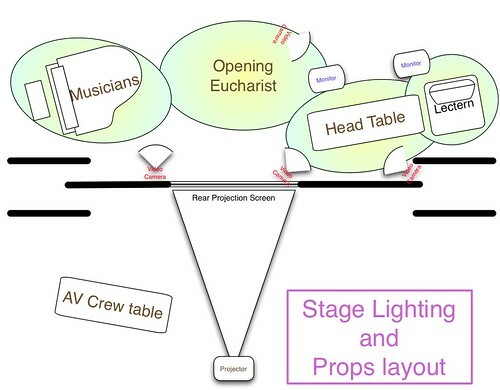 Develop a stage lighting diagram at least 2 months before convention so that the Sherwood Hall AV and IT staff in Salinas can work with us to optimize things. Use an 8-1/2″ x 11″ sheet of paper – same proportions as the actual 40′ x 60′ stage. Get a projector that has at least 2,000 Lumens.